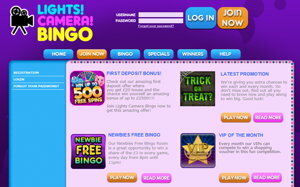 Lights Camera Bingo was launched in September 2011. It originally came out 2 months earlier, and went under the guise of Quiz Show Bingo, however creators decided to change the name and give the site a makeover and a complete relaunch. It was the first ever offering of the Jumpman Gaming bingo software, which has since gone on to be used on many other online bingo sites such as Showreel Bingo and Zingo Bingo. The site on first glance looks really fun, with excellent graphics and a really bold and an exciting colour scheme. It’s based around a movie set theme with spotlights and cameras appearing throughout, however it really doesn’t offer much more than that unfortunately. The gaming on offer is really limited and the bingo choices especially are very small. You’ll find a basic collection of 75 and 90-ball bingo games that are spread across just a few rooms, but there is an option to play free bingo sometimes and there is a decent selection of slots and side games too. The promotions aren’t bad, and there are a good selection that are updated quite regularly with a really great welcome bonus for all new players. There’s plenty of chat games and bonuses on offer throughout too, and it’s a nice place to get social and chatting way. The site isn’t terrible at all, it’s just quite basic. This might actually be a good thing however, as some players like to keep things simple. A lot of the newer sites now can be quite overwhelming these days, with too many games and you can feel bombarded with information, so Light Camera Bingo might be the right choice for you if you’re after classic bingo and a simple site to make new friends. It just doesn’t offer very much in the terms of bingo compared to many other sites out there, and the whole feel of it is just ever so slightly bland. The welcome bonus at Lights Camera Bingo is fairly decent. Simply click on the link at the top of this page for more details. Terms, conditions and eligibility criteria apply, and all players must be aged 18 or over. Other promotions include Friday Night Takeaway, Tuesday Treasure, Streak Buster and Refer A Friend. In Friday Night Takeaway you can win yourself a slap up meal. Simply grab a full house at 8pm on a Friday, and you’ll win a £50 meal for the following week. In Tuesday treasure you bag your share of a £1000 jackpot and Streak Buster gives you 6 free tickets when you gain 5 stars in a row. Lights Camera Bingo also offer a loyalty scheme and there’s 5000 loyalty points on offer if you refer a friend. Lights Camera Bingo runs on the Jumpan Gaming Bingo Software, and is licensed and regulated by the Alderney Gambling Control Commission and also the UK Gambling Commission. As mentioned before, the bingo on offer here is fairly limited. You’ll find a small selection of games in 75 and 90-ball formats, and there’s also free bingo available too. The promotions do add a nice twist to some of the games however, and there are always nice bonuses and jackpots to pick up along the way. Ticket prices vary from 1p to £1. There are a nice selection of slots, instants and casino games available at Lights Camera BIngo, and they give players a good offering alongside the small bingo selections. You’ll find popular favourites such as Fluffy Favourites and Sugar Train, and there’s also a chance to win free spins on every deposit. You will only be able to fund your account and make withdrawals via card on this site. There are no other options such as PayPal or ewallets, so it’s something to bare in mind upon registration. Please read all terms and wagering requirements upon registration, as details are always subject to change. After your 2nd deposit you will only qualify for bonuses on a £10 deposit. IG wager is 40x bonus. On first glance the website looks really quite intriguing, however when you get past its flashy exterior there’s something missing from this bingo platform unfortunately. With limited games and minimal ways to pay, it really is quite a basic site. If you’re after a platform that purely focuses on 75 and 90-ball gaming with a few slots and casino on the side, that isn’t too complicated, then Lights Camera Bingo is a good, simple choice.